All of us at the American Independence Museum and the Society of the Cincinnati in the State of New Hampshire are grateful and excited that we are able to loan three of our precious documents to the DAR Museum in Washington, D.C. ​for a period of 6 weeks this spring/summer. As the Executive Director of the Museum, I recently had the opportunity to travel with the documents and install them into their new home in the Museum. I am grateful to share the story of the precious documents, and their loan with you today. You can learn more about the documents and other related items owned by DAR here: http://www.dar.org/broadside. 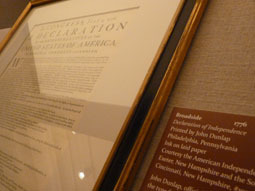 At the American Independence Museum and within the Society of the Cincinnati in the State of New Hampshire, we all refer to 12 total pieces of paper as “the documents.” They are precious, priceless and together illustrate the tenacity and determination of the minds of our founding fathers. These gentlemen banded together--and using the words, thoughts and arguments of other men throughout time, they compiled one essay to unite a rebel cause in war against the largest super power in the world. Slightly over a decade later, their comrades united again to discuss, debate, and write the way we will choose to govern ourselves – the way we continue to govern ourselves today. Farmers, lawyers – they did all of this with the world watching and waiting to see what might happen next. 1 Page ~ The Declaration of Independence. Our document collection starts with the first piece of paper, the biggest – a Broadside. Weeks before that famous handwritten one you know so well on display in the National Archives was commissioned to be written out and months before that one was completely signed, the Continental Congress agreed upon words written on a few pieces of paper. War was already happening in the northern colonies – but why? The rebels did not have a central reason, a defining argument. What were they fighting for? Freedom from tyranny? Or just less taxes? What were the reasons for this rebellion? Before the Declaration of Independence was written, it was unclear. But once written, it unified a cause. When you actually read the document, the words are clear. There are so many accusations against “he” – King George III, against the freedom and liberty of the people of the Colonies, there was no choice. The rebellion was not to lessen his hand, but to force it. So, on this day in July, 1776, the Congress votes, but then what? A unified voice written down on one copy of paper cannot quickly be disseminated in a world hundreds of years before Twitter. Members of Congress take these notes to John Dunlap, Congress’ printer of the time, and Mr. Dunlap works through the night typesetting these famous sentences and prints around 150 broadsides – the Dunlap Broadsides, the first copies of the Declaration of Independence. They were printed, and sent on horseback to the various capitals of the colonies to be read aloud – an act of treason. They were large enough to poster the sides of Taverns, and they told a budding new Nation of our ability – our necessity -- to unify and mobilize a fight against the King. The next document is 7 pages long and begins with “We the People of the States of New Hampshire…” Years after the War was declared over, a new Nation struggled to form its government. It was the summer of 1787, and it was clear to many in government that the Articles of Confederation were not allowing our young Nation to be successful. Delegates were selected from each state and most convened in Philadelphia to iron this problem out. To those who arrived early, it quickly became apparent that a fix to the Articles was not an option and a new document must be drafted. By the end of July, the first draft of the United States Constitution, the Committee of Detail draft, was created and was debated within the Convention. Our 7 page copy of this draft was owned by Nicholas Gilman, Jr. – NH representative who appeared at the Convention late, but just in time to share his growing opinion that a Federal government would be a better option for our people. On these 7-pages, you can see his notes from the proposed changes of the group. All Convention members were purported in saying that not one member would be completely satisfied with all aspects of the end result of the Constitution itself, but all would be gratified at this chance to create a new and operational government for their people moving forward. The Committee of Detail draft’s notes and importance are even further illuminated when it is compared to our Committee of Style, 4 page draft of the Constitution, once owned by Massachusetts representative and Committee member, Rufus King. After moving through the Committee of Postponed Matters (of which our own Nicholas Gilman, Jr. took part), the document then went into review by the Committee of Style, Mr. King a prominent member. The most obvious change from the earlier draft also can arguably be the most profound, now the Constitution reads: “We the People of the United States…” In those short weeks, and with much debate and consideration, we unified ourselves into one great Nation – as seen through writing here. This final draft went onto be voted on September 17th and ratified in the months following. In little over one year, our country, its structure, and its governing laws were born when New Hampshire becomes the 9th state to ratify and the Constitution is established on June 21, 1788. These papers, these documents-- are papers with words. But it is the power of those words and the feeling and intent in the men behind the words that live on today. To view the pages of the draft constitutions with Nicholas Gilman Jr.’s or Rufus King’s handwritten notes, is to see the process of how our government was formed. You can see the thought, the change, the purposeful and important need to get it right. It was not lost on me throughout our journey to Washington, D.C. with this precious cargo in modern transportation that we passed through Philadelphia. The last time these documents resided in that area – for the Broadside—was probably the night it was printed. For the constitutions, it was likely those weeks after printing when our founding fathers debated over them. All of us at the American Independence Museum and the Society of the Cincinnati in the State of New Hampshire are thrilled to be sharing these important pieces of the founding of our Nation in the capital of our Nation for these next few weeks. We hope all will get a chance to feel the history and understand our origins when they see them on display at the National Society Daughters of the American Revolution Museum now through July 9. The American Independence Museum promotes awareness, increases understanding and celebrates the freedoms of American Independence to recognize the many facets of the founding of our Nation, and to encourage and inspire civic engagement today. Founded in 1991 with the strength and guidance of the Society of the Cincinnati in the State of New Hampshire, the Exeter Community and the State of New Hampshire, the American Independence Museum operates out of the National Historic Landmark Ladd-Gilman House (c. 1721), the Folsom Tavern (c. 1775) and educates thousands annually using innovative programming, and by highlighting the important documents and Revolutionary War items in the Society’s collection. The Nation’s oldest patriotic organization, the Society of the Cincinnati in the State of New Hampshire is one of the 14 chapters of the National Society. The National Society was founded by the officers of the Continental Army and their French counterparts who served together in the American Revolution. Its mission is to promote the knowledge and appreciation of the achievement of American independence and to foster fellowship among its members. 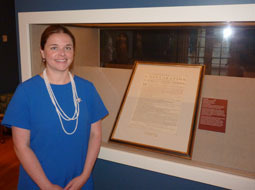 The NH chapter of the Society works in partnership with the American Independence Museum to share its holdings and educate the public about the founding of our Nation. #TBT 125 years ago, on April 19, 1894, the Sequoia Chapter in San Francisco, California, planted a �... 19 hours 35 min ago.